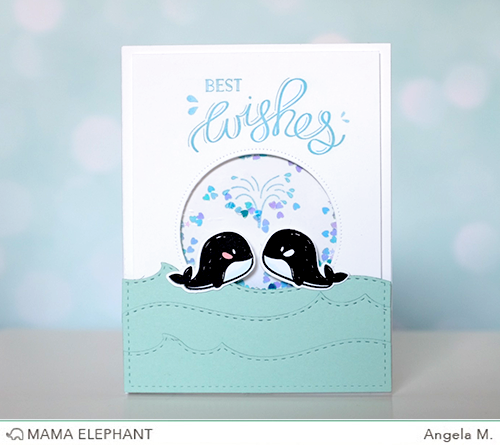 mama elephant | design blog: March Release and STAMPEDE! Shaker card by Angela using the sketchy whales from Whale Wishes and Ocean Waves Trio Creative cuts. Join us and make a SPLASH! This new release is amazing, I picked up the whale and the butterfly set. Can't wait to see all the inspiration! Super release!!! The killer whales are too cute! Thanks for the extra chances, ME! So much cuteness in thr new release, so every chance helps. Loving the new whales! I LOVE the whale stamp set!!! its adorable!! Love this stamp so cute! The whale stamps are beyond cute. Super cute release and projects!! A cute release. I like the emoji's a lot! An awesome Stampede!! Loved every single post! TFS ladies! Love the new sets especially the whales! Love these tiny hearts as shaker elements with cute whales and that wavy borders are awesome! Super cute!! I love the whales and the scripture writing! Love them all!!! The whales are adorable! Thank you for the generous chance. So cute!! I love seeing what the designers come up with because sometimes I see a set and have no interest in but then I see what they do with it and then I HAVE to have it! This is a fantastic release! As an oceanographer and crafter, I had to buy this beautiful orcas, a great match for the penguins! I already follow you on instagram as annderi. Thanks for this new stamp set! As always, your stamps are so cute! Liked and following you on FB! The whales are too cute ♥ love them!! What a really cute card! Thanks! Fabulous release !! I am in love with Spring Garden stamps and Picket Fence die!! Thanks for the chance to win! I like you on FB. And yes, I shared your post on FB too. Such a lovely release !! Thanks for the chance to win :) The whale stamp set is just too cute! Great release. Love the whales and the flowers. So many cute stamps! Following you and tweeted on Twitter. How exciting! I've been LOVING all of the creations with the new stamps!! Love, love, LOVE this release! Thank you for more awesome-ness!!!! :D! Love this release!! The whales and emoticons are sooo adorable! And love that ur waves have the perfect peak!! The new release is just precious!!! I love the Butterflies so much and can't wait to order my set today. I love all your stamps. It would so hard to choose just one. Lol. And I'm an Instagram follower, too. Those little whales are darling! I always enjoy seeing the new stuff. My daughter will love the Emojis. I'm excited about the Little Emotions set! the whales are really cute. The DT did a great job highlighting them. Love how they are having so much fun in the water. I like you on FB and will share this post. Amazing. I love all your stamps :) they are so versatile. I like you on facebook :) P.S. I was wondering if you will have any challenges in the future? Excellent release! Whales are my favorite! Such a cutie! Another great release, your products are amazing! Angela's card is adorable. Oh my gosh, you guys have the cutest stamps!!! So many fabulous new goodies! You girls never disappoint in the 'Cuteness' department!!! Following on FB & shared this post. I love your stamps!!! These are adorable! The whales are so cute! Cute collection! Hoping I go to see the rest of the DT! I'm just going to give you my money now. Excited to see the release in the full. Ready to see more DT work. DT has done an amazing Jon with this release! Awesome release as always :) great inspiration. Hoping my 4 chances are enough! Can't imagine how hard it would, or will be – positive vibes all the way – to pick only one set of stamps! I love Butterfly Kisses and Little Emotions. All the new sets are great. Fun release! Love the card! Sweet shaker! Love the whales! Why is it I can never have enough butterflies?!! I love everything about this! The scroll font is so pretty! The whales are adorable! They really pop against those soft, aqua waves. Such a cute Whale card. love the new sets. I am really loving your new releases. I cannot wait to buy some for my collections. Congratulations on a fabulous release! Looking forward to seeing all of the inspiration along the Stampede! it's a super beautiful new release!!! luv all the new stamps and dies - awesome! Fabulous new stamp sets! Love the card! The best wish whale card is adorable. I have a ton of faves so I have to pick out the ones I really, really, really, really want. So many pretty, adorable, wonderful stamps and so little money to buy a lot of them! What is a girl to do? LOL Win something! Adore your whale shaker card! Love the whales - just one of many tempting sets in this release! Love the whales, thanks for the chance to win! This new release are awesome! always love your designs!!! I adore your new release!! Another awesome release! The whales are too stinkin cute!!! Anticipating every release of yours every time! ^^ please continue to bring joy to crafters like me! I bought all of your awesome new release yesterday. Looking forward to receiving and creating. Just finished the hop and WOW! Talk about amazing inspiration from your DT; smiling all over my face in seeing their showcases of your delightful release. A favourite? Hmmmm, aside from everything *grin* I'm going with the whales and the lovely butterflies and flower. Those two sets are versatility, plus! I love your new releases!! Such fun products! The orca stamps are so cute! Super cute whales!! The card is really cute! Love the new release! I'm a dedicated follower!! Loving the whale wishes set! LUV your Ocean Waves Trio dies! They have two different tops on each wave! Smooth AND pointy!! Yay! Cute ocean scene for these adorable whales. I just love it when ME has a new rekease! Please keep the magic coming! Wow! Thank you for this amazing chance!Beautiful card and release!!! Following all places for a long time.. Love you guys and all your products..
Love your work and that whale set is the cutest! !